It could be said that Garry Hoyts Alerion Express 28 was ahead of the big daysailer trend when it was launched in the early 1990s. I took his latest entry in this growing genrethe Alerion Express 38for a test sail in light air off Newport, Rhode Island.Under SailThe boat is designed to excel in light air, and my test sail proved it was up to the task. 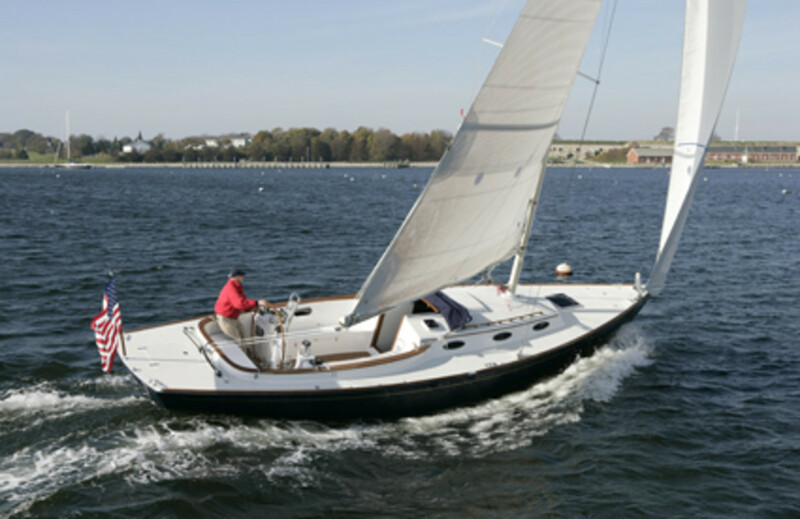 It could be said that Garry Hoyt’s Alerion Express 28 was ahead of the “big daysailer” trend when it was launched in the early 1990s. I took his latest entry in this growing genre—the Alerion Express 38—for a test sail in light air off Newport, Rhode Island. The boat is designed to excel in light air, and my test sail proved it was up to the task. Upwind speeds were 5 to 6 knots in barely 8 knots of wind. We tacked through 75 degrees. The helm was perfectly balanced with just the right amount of weather helm. The boat tracked beautifully. No problem taking my hands off the wheel for minutes at a time. The Hoyt Jib Boom with nonoverlapping headsail reduced tacking to simply turning the wheel. Off the wind, the jib boom helped keep the jib filled even when sailing by the lee, dead-downwind. With sails wing and wing boatspeed was 2 to 3 knots. Excellent light-air performance comes from the boat’s mainsail; it’s oversized, laminated, full-batten, heavily roached, and can be reefed easily. A tall (56-foot) painted carbon rig puts considerable sail area up where there is usually more breeze, and eliminating the backstay allows the large roach to tack around unencumbered. Both the main- and jibsheets run to powered winches on pods directly adjacent to the helm station. This allows for true singlehanded operation. With high seatbacks and deep, slightly angled seats, cockpit and helm-station comfort were excellent (however, a brace point running down the center of the cockpit could be beneficial). Several deep cockpit lockers provide excellent on-deck stowage for lines and fenders.